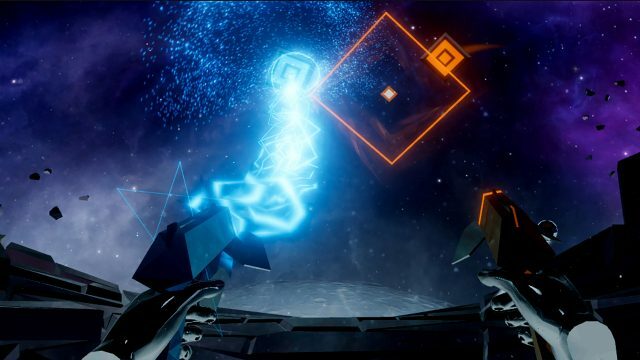 Harmonix, the studio behind many rhythm game hits like Guitar Hero (2005) and Rock Band (2007), today announced what they’re calling a “VR rhythm shooter” that looks—to be frank—pretty freaking awesome. I guess there’s just something about combining body movements with music that is naturally appealing (who would have guessed? 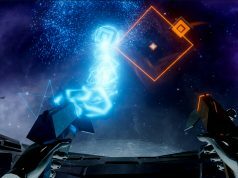 ); as someone who has said on more than one occasion that a VR gun game featuring ‘instructed gameplay’ (in the vein of Beat Saber) could be tons of fun, I was thrilled to see today’s announcement of Audica, which looks to skillfully tie together gun mechanics with some audio-visual instructions to create a game which looks to only really make sense in VR. The game is slated to launch in Early Access on March 7th, and is set to come to the Oculus Rift and SteamVR (ostensibly supporting Vive, Windows VR, and Rift). Harmonix hasn’t yet mentioned support for the upcoming Oculus Quest, but they’d be missing a huge potential opportunity if they aren’t already designing Audica to land there eventually (my guess is that they are). As for the game’s mechanics: from the trailer we can see a variety of distinct ‘shot’ types that players will need to manage: there’s a ‘hold’ shot (which looks like electricity), ‘straight’ (circular target), ‘sideways’ (horizontal target), ‘rapid fire’ (strings of diamond targets), and ‘hit’ notes where the player has to smack a sphere with their gun. While the type and timing of each shot is clearly visible, I’m very interested to see how (of even if) the game helps players understand how to move from one note to the next. One reason why Beat Saber feels so good is that notes are confined to a small area in front of the player and they also explicitly indicate the swing direction; it becomes intuitive over time how one would move from one block to the next (given the note position and swing direction), even when playing tracks you’ve never played before. With Audica’s notes seemingly covering a much larger potential area, it may be challenging to help the player understand which movements between notes will be best, short of raw practice and memorization. Something else I’m curious about about is the frequency with which users will need to pull the triggers. I’ve played a handful of (bad) VR games that basically ask the player to continuously pull the trigger to shoot a pistol for the entire duration of gameplay, which can very quickly lead to finger strain. 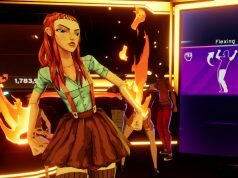 Harmonix will need to be careful not to directly tie track difficulty to trigger frequency, and to smartly rely on a mix of mechanics to avoid finger fatigue (as they appear to be doing so far in the trailer). The team has notably avoided answering questions about the potential for modding and custom music in Audica, which is understandable considering issues with music licensing. Those capabilities are an essential reason why Beat Saber has formed a strong and active community. Audica isn’t Harmonix’s first foray into VR, but it does look to be their most inventive—and dare I say, promising—yet. 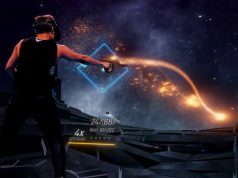 The studio actually has a significant track record across major VR platforms, having previously released Harmonix Music VR (2016) on PSVR, Rock Band VR (2017) on Oculus Rift, and SingSpace (2017) on Gear VR. The point in the article about how Beat Saber does a good job showing the player how they should move to make the next action helped me put a finger on why I keep coming back to the game’s original songs, while I only dabble in the custom tracks. Too often, it doesn’t really feel like the custom tracks flow nearly as well as the original tunes. I don’t know if it’s just that the swings don’t move gently from one direction to the next or if there’s also an element of blocks not quite being placed in the rhythm of the game, but I’ve yet to find a custom track that is as fun to play as the original soundtrack, other than the novelty of having a recognizable song. I think there are now in total close to 15k custom tracks and 10% of it is as good if not better. From my own experience, I download 20 tracks and keep 1-3, the rest is junk indeed. Are there any specific tracks that you can recommend as being well-mapped? Or is there a specific mapper that you think is worth following? Try what I do: go to beatsaver_com, sort by top rated and open the links to the creators(uploaded by) to find out if they have more great songs. This way I found out about bennydabeast, rustic, Kolezan etc. I currently enjoy the most: YoiYoi Kokon – REOL (by Koleza), 24K Magic – Bruno Mars, New Rules – Dua Lipa (by bennydabeast), GOMD – Sickick (by Freeek). What difficulty are you playing at? Just on Hard. I’ll give him a look though. I’ve just been getting tracks by scrolling through the most popular ones, but finding a mapper that does good work is probably a better bet. It’s tough finding good maps for lower difficulty than Expert, but they’re out there. Hopefully some from BennyDaBeast include Hard for you, he’s made some really impressive stuff and was actually hired briefly to make some official maps for Beat Saber too. When you mentioned him I noticed that he did that Pop Stars track, which may be the best official track for my money. Worth checking his other stuff out. Thanks! We need a competitor to Beat Saber!.. I hope it has better music than that horrible track in the trailer. I am also sceptical how much fun the movement will be here. Beat Saber is so endlessly enjoyable because of the flowing swings you make. Here you are constantly aiming for things which for best precision requires you to keep your arms stretched out most of the time. And something else bothers me… pressing the trigger thousand times per track..
Can I request some real music? I’m still waiting for a good dance game. Maybe that requires body tracking? Have you tried Beat Saber? It isn’t specifically dancing, but with the right tracks it can feel like it! Yup. Probably my favorite game in VR. Tracks with good flow feel really nice. Dance just seemed like a natural evolution.